Apparently, this dead horse still needs beating: The megalodon is definitely extinct. 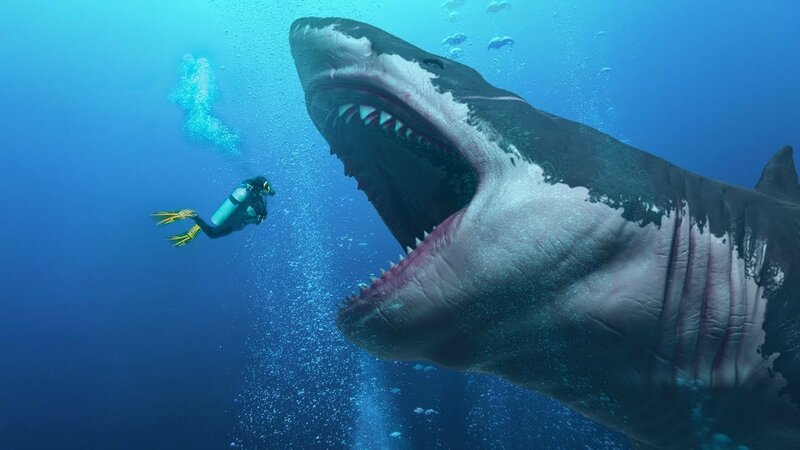 But The Meg, a summer sharkfest blockbuster set to premiere on August 10, might have you believe otherwise. The film is certainly not billed—even facetiously—as a documentary (take note, Discovery Channel), but if the Jurassic Park franchise taught us anything, it’s that the spark of the imagination needs only the slightest passing breeze to roar into a conflagration. The true story of the megalodon may not culminate in a jaw-dropping showdown of man versus shark—but its legacy is no less cinematic. 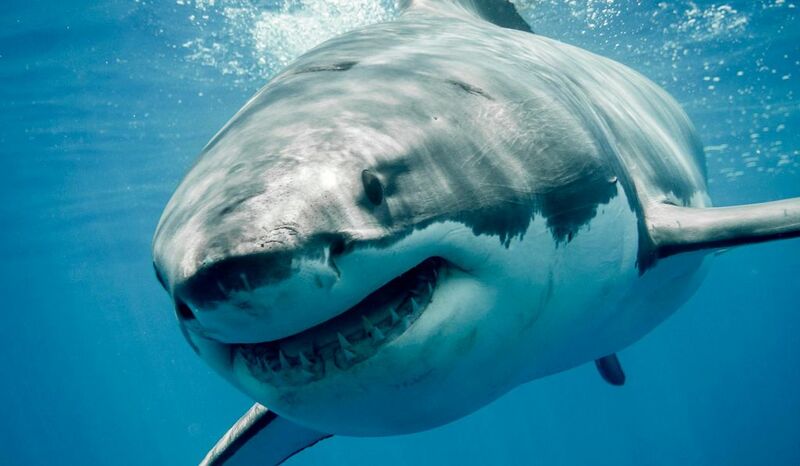 To keep in tip-top shape, megalodon likely snacked on whales, dolphins, and seals, consuming a literal ton of food each day—a job made easy by serrated six-inch teeth that, en masse, have the strongest bite force of any animal in history. 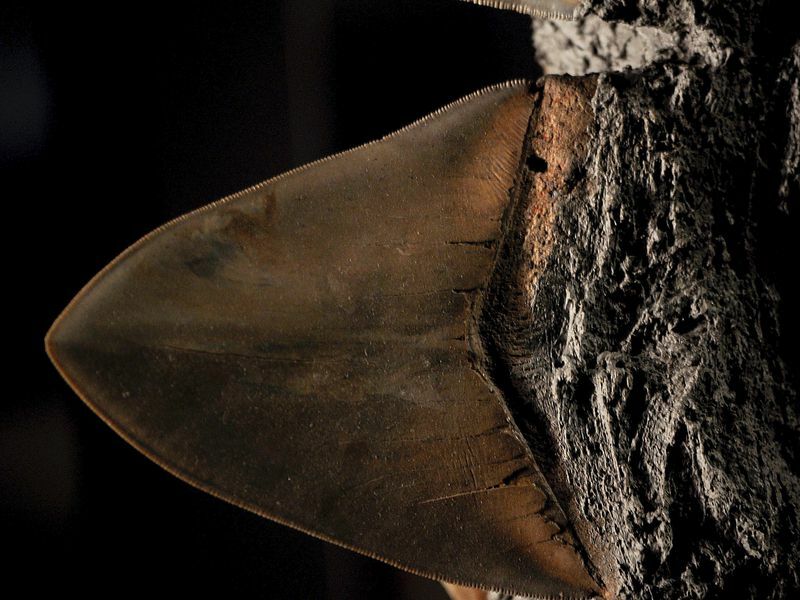 Even if megalodon occasionally scavenged, they were likely active predators, as evidenced by the ghastly grooves found in whale and dolphin bones scattered along the world’s shores. Megalodon teeth have informed much of what scientists know of the creature, partially out of sheer abundance. Unlike humans, sharks cycle through teeth continuously, shedding 20,000 or more into surrounding waters in the course of a lifetime. On the heels of each sloughing event are up to five new rows of teeth arranged like concentric roulette wheels, waiting to take their predecessors’ place. According to Hans Sues, curator of vertebrate paleobiology at Smithsonian’s National Museum of Natural History, the meg teeth humans have dredged up number in the high thousands, and these fossils have been an important source of information on the beast. Teeth are not just the most abundant meg relic; they’re also some of the only meg relics that have survived to present day. Sharks are cartilaginous fish—only a minority of their skeletons are calcified. They’re basically big, fleshy ears with fins (and in this light, much less terrifying). Lightweight and springy, a cartilage-based form is conducive to speedy swimming in pursuit of prey. But what’s good for the meg hasn’t been good for shark researchers: Cartilage simply isn’t built to survive the ages, meaning the meg’s left behind a pretty spotty fossil record. Sadly, the same awe-inspiring attributes that defined megalodon existence may also have been what drove this top predator into extinction. The exact nature of its disappearance is still heavily debated, but it’s likely a number of factors contributed to the meg’s demise. At such an indomitable size, there was little in the sea the meg couldn’t nosh on. With no predators of its own, megalodon ruled a dictatorship, dominating a cosmopolitan range of habitats. All megalodon needed to flourish were abundant, blubbery prey and coastal nurseries in which to breed. But around 2.6 million years ago, the last of them seem to have abandoned ship—right around the time of the most recent ice age. The timing’s no coincidence: Global cooling did a number on the meg. It’s possible megalodon struggled to stay warm as waters grew chilly. But according to Catalina Pimiento, a paleobiologist and megalodon expert at Swansea University and a fellow at the Smithsonian Tropical Research Institute in Panama, a tweak of the world’s thermostat was likely of little concern to a hardy species that had conquered all but the iciest of the world’s oceans. Like great white sharks, megalodon were probably actually pretty good at maintaining a body temperature warmer than surrounding waters—a trait rare amongst fish. Rather, Pimiento says, as sea levels fell as the oceans iced up, the availability of prey habitats gradually declined, felling with them an estimated 55 percent of marine mammals—mainstay meals for the megalodon. At the same time, other top predators like killer whales and great whites began to swim the seas, further straining the meg’s grasp on its dwindling resources. By the time temperatures began to climb, megalodon were long gone. To be fair, megalodon are pretty recently deceased—relatively speaking, at least. The end of the dinosaurs dates back to about 66 million years ago, while these super sharks were splashing the seas almost 64 million years later. But timing is really the meg’s only vote of confidence, and a weak one at that. A few million years is a long time to slink beneath the surface of the sea unnoticed, especially when you’re as long as a standard bowling lane. What’s more, to remain in permanent stealth mode in those treacherous depths, megalodon would have needed to undergo some pretty drastic changes. The bottom of the sea is dark and frigid. The creatures relegated to these habitats have been forced to come up with some pretty creative ways to weather the extremes—and the further down you go, the weirder things get. According to Skomal, great white sharks—our best living megalodon proxy—can’t tolerate the deep sea for more than a few hours at a time. Adding to this problem is the fact that the deep ocean is—compared to the shallows where most prey frolic—fairly sparsely populated. Even swaddled in the coziest of down jackets, deep-sea megalodon would be in a constant calorie deficit. Bretton Kent, a professor at the University of Maryland who studies extinct sharks, adds that many of the ocean’s most abyssal residents tend to be slow swimmers that gum on teeny prey—a portrait incompatible with the meg’s modus operandi. If some version of this extinct shark exists in the sea’s trenches, it wouldn’t be much of a megalodon at all. Shark experts are confident that we live in a meg-less world. But would it be possible to fill that meg-sized hole in our hearts and bring it back, a la Jurassic Park? According to Ehret, “it’s just not gonna happen.” Science is probably even further from cloning these bitey behemoths into existence than, say, a Tyrannosaurus rex. Theoretically, there are a couple ways this could happen—and both are dead ends. In the first, scientists could take a living descendant of an extinct creature and forage in its genome for ancient genes that have since gone dormant. Flipping these switches back on might allow the expression of some ancestral characteristics. It sounds crazy, but some researchers are working on turning back the chicken clock in the hopes of hitting dino paydirt. But the last of the megatooth lineage died out long ago. The second way—starting from genetic scratch—is even tougher. To engineer a megalodon, scientists would probably need DNA—and this has so far eluded even the most dogged of divers. DNA isn’t built to last for millions of years. Even if scientists get lucky enough to leech a few fragments of megalodon DNA out of their teeth, this would only be the tiniest of baby steps in the right direction. The vast majority of the puzzle pieces would still be missing—and without context, chunks of genes aren’t of much use. Sues, the paleobiologist, compares the process to attempting to assemble the Manhattan phone directory with just two phone numbers. But let’s suspend our disbelief for the briefest of moments. Say a bizarre accident of genetic engineering were to happen—or a cavernous time portal were to ensnare a snarling specimen and spirit it three million years forward into the present. If the stars aligned, would megalodon prey on people? Pimiento agrees that humans wouldn’t be the first thing megalodon ordered off the menu: “We’re not fatty enough.” With far more blubbery options like whales and seals, megalodon wouldn’t waste their time chasing such lean, paltry morsels. But to be fair, food is food—dangle a human in the face of a ravenous meg and it probably wouldn’t turn up its nose. In any case, there is no reason to fear a rogue meg attack the next time you hit up the beach: We reached the end of that fish tale long ago. But even after Ehret disappoints hopeful museum patrons with this news, he doesn’t like to let them sulk for long.